"The Godfather of Reality TV" John Barbour is now available for interviews and select review copies of his book are also available. A high school dropout at 15 and deported from the US to Canada at 17, readers will discover the multi-faceted John Barbour, known as the Godfather of Reality TV for his role as creator, producer, co-host and writer of the trendsetting hit Real People in his memoir, Your Mother’s Not a Virgin! 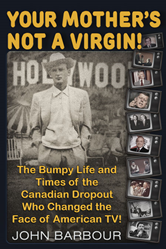 The Bumpy Life and Times of the Canadian Dropout Who Changed the Face of American TV. Real People debuted in 1979 and featured everyday people with unique occupations or hobbies. One of the original reality TV shows of its time, the show was NBC's most popular series and was a rare hit for the channel at a time when the network was a distant third in the ratings among the other major networks. As the show’s 40-year anniversary approaches, Barbour is using the book and traveling the country to commemorate its history and significance. Barbour won the first of his five Emmys as the original host of AM LA in 1970, where he interviewed controversial anti-war guests like Muhammad Ali, Cesar Chaves and Jane Fonda. He was the first in America to do film reviews on the news, winning three more consecutive Emmys as KNBC’s Critic-at-Large. He spent ten years as Los Angeles Magazine’s most widely read and quoted critic, and early in his career, he made stand-up comedy appearances on The Dean Martin Show, The Tonight Show and others. Entertaining, witty, as well as inspiring, Your Mother’s Not a Virgin! will keep readers turning the pages as they learn about the numerous celebrities that have crossed Barbour’s path, including Lenny Bruce, Johnny Carson, Frank Sinatra, Muhammad Ali, and numerous more. Barbour is now available for interviews and select review copies of his book are also available. Please contact J. Barnes for more information.